Since April 2017, we have captured attacks launched by Satori malware. By analyzing our captured attack logs and sample analysis results, we identify that the Satori family has three main variants, showed in Figure 1. Our analysis shows that these three variants execute different commands, listed in Table 1. The 1st variant only scans the Internet and checks which IP address is vulnerable in the telnet login by attempting different passwords. Once it successfully logs in, it first enables shell access, and then only executes the commands “/bin/busybox satori” or “/bin/busybox SATORI”. The 2nd variant added a packer, likely to evade static detection. 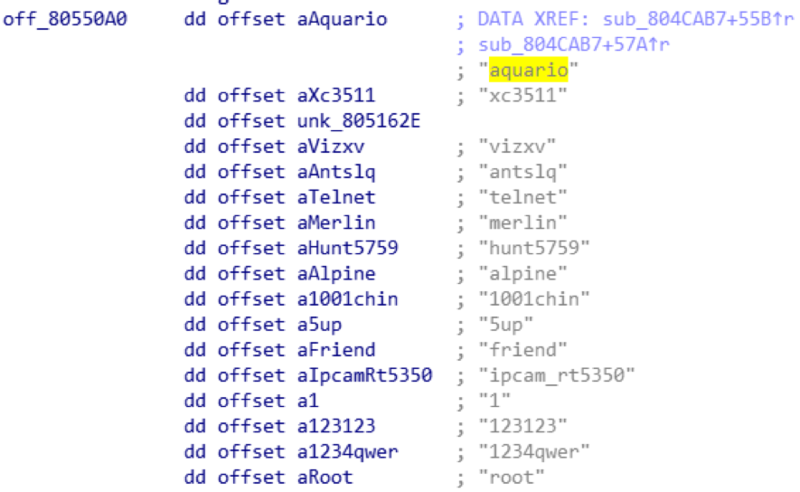 In the meanwhile, the attacker adds the “aquario” password in the password dictionary (in Figure 2), and it always uses “aquario” to login at its first attempt. “aquario” is the default password for a popular wireless router in South America countries. It indicates that the attacker intentionally started to harvest bots in South America. The 3rd variant uses exploits for two remote code execution vulnerabilities, including one zero-day vulnerability (CVE-2017-17215). Some of the 2nd variant samples share the same embedded commands (in Figure 3) with the 3rd variant. As Mirai’s source code is open sourced in Github, attackers could easily reuse Mirai’s code to implement the network scanner and the password brute force login modules for launching a telnet brute password force attack or other attacks. The Satori family reuses some Mirai code, including the network scanner, telnet password attempting and watchdog disabling (in Figure 4). Satori also traverses the “/proc” to kill other processes by searching eight strings in “/proc/PID/maps” and “/proc/PID/exe” (in Figure 5). In the second variant, we notice that the killing process behavior differs in different devices. Satori checks whether a compromised device is a specific device type by searching keywords “/var/Challenge”, “hi3511”, “/mnt/mtd/app/gui”, “gmDVR” in the “/proc” in the same way. But, in the corresponding four IoT devices, Satori does not kill processes. From these four strings, we suspect that the Satori’s author has started to reverse firmwares of IoT devices and identify the device type for future attacks. The Satori malware family demonstrates that IoT malware is evolving all the time from the simple password brute force attack to the vulnerability exploit attack. Mirai’s open source code gives IoT malware authors a good start point to develop new variants. It would be a notable trend if IoT malware authors continue to rely on using more known vulnerabilities or discovering zero-day vulnerabilities to attack IoT devices. Palo Alto Networks has released the IPS signature (37896) for the zero-day vulnerability exploited by Satori. WildFire also has covered the detection for Satori samples and the C2s are categorized as malware. AutoFocus customers can investigate this activity with the Satori tag.